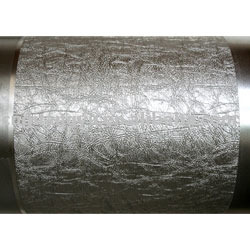 We are the prominent manufacturer of Embossing Roller. Our Embossing Roller offer exquisite gradation and colors. Highly durable and easy to use, these Embossing Rolls are used to produce medley of patterns on plastic, glass, paper, artificial leather and other material. Offered at market leading prices, these rollers can also be customized as per the needs and industrial usage of the clients. Presenting our wide and comprehensive gamut of best quality Embossing Roll. These Embossing Roller are highly adorned due to their better quality and superior designs. Embossing Roller is made using sophisticated machines that provide flawless designs and ideal working conditions. We, Ambica Enterprise established in the year 2008 are engaged in manufacturing & supplying a wide range of Embossing Roll, Flooring Embossing Roll, Textile Embossing, Car Mat Emboss, Conveyor Rim Zim Roll, Embossing Roll and Industrial Roll & Spring. At present Our company is in the possession of state-of-the-art manufacturing facility. It comprises of advanced and latest machine molding processes and semi automatic sand plant. Also, The main competitive advantage of our company is the Good Financial Position and Total Quality Management System. Thus, our highly efficient and professional quality controllers administer a series of quality tests on the entire range before approving for final delivery. The entire range of products manufactured by us is widely appreciated for its renowned features such as sturdy nature, corrosion resistance, durability and reliability.